Back at Christmas time, I wrote a post on easy but meaningful ways to celebrate with small children while staying focused on the Jesus story. 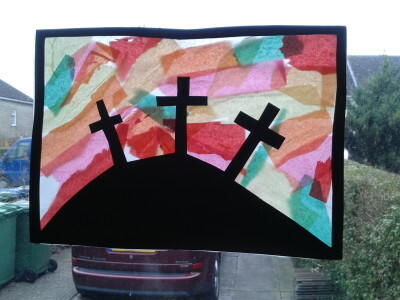 It was a really popular post so, as Holy Week approaches, I thought I’d point you in the way of some easy but meaningful Easter ideas for kids in a similar vein that won’t send you screaming for the hills! We all have our different pain thresh holds so if yours is crafting or baking, feel free to ignore those suggestions! Firstly, I’ve overheard a few discussions over the years about how to handle the really gruesome parts of the crucifixion story with small children. I read a great post on that here and, while I’m linking to OhAmanda, we took the plunge and bought her e-book, ‘A Sense of the Resurrection’ which has lots of very adaptable, multi-sensory activities to help explore the Easter story over a number of days. So far, my kids have LOVED it and it hasn’t been particularly strenuous. She does most of the work for you and you can adapt the ideas, picking and choosing, as you see fit, Totally recommended and will give you lots of crafting type activities to do over the forst week of the Easter holidays. Items throughout your house will remind you constantly of the Easter story through sight, sound,taste, smell and touch. It’s genius and my favourite resource this year. If you are already maxed out but have a working computer printer, basic colouring sheets and activities are really helpful. I have a Pinterest board for Easter here which will show you some links to easy activities. I liked the Easter story napkin rings which were simply printed out and stuck into circles ready for Easter Sunday lunch. We will once again be getting out our Resurrection set. 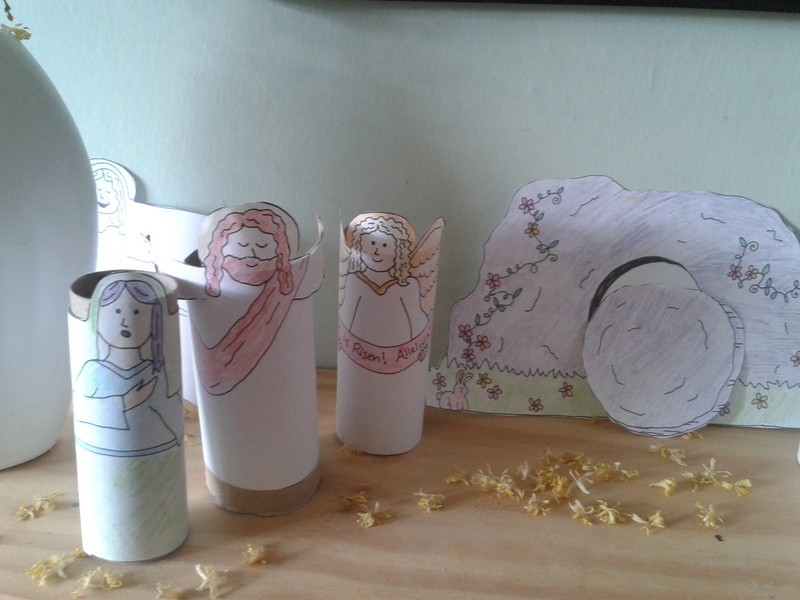 It’s a little like a nativity set but for Easter and gives the children a tactile way of interacting with the Easter story. It would be easy for a 6 year old to make themselves or, if you’re happy to spend half an hour colouring in front of the TV, a strangely soothing activity, you can do it yourself. You stick the print-out onto loo rolls. Super-simple and it looks better in real life than it does above! 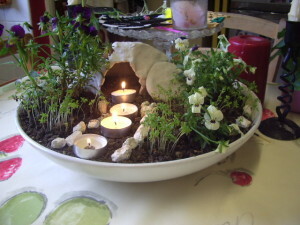 This Easter garden is really quick to make if you have a large shallow container. I’ve also seen it done with a flower pot on its side for the tomb, covered with earth. This one was made with air-dry clay. Finally, although I am happy to make a lot of effort to make Easter really special for the children, you don’t have to make everything yourself and wear yourself out. A bunch of daffodils on the table, some candles and pain au chocolats and orange juice for Easter morning breakfast can just show your children that Easter is special. The supermarkets and garden centres have a great range of Easter bunting these days. I also try and play a recording of the Allelujah chorus on Easter morning as the family come down. In the end, the greatest gift we can give our children at Easter is to slow down and enter into the wondrous story with them. Have you planned in the time to do that? Yep, I’m off to scrub a few things off the calendar too. I love all these ideas! So glad you are liking Sense of the Resurrection! We really are! My 5 year old daughter said last night (unasked) that it was her favourite time of the day. Thank you for all the work, thought and passion you put into it, Amanda. I know many families will be experiencing Easter in a a new way through your book.